Sometimes walking down the aisle can feel like walking the plank. 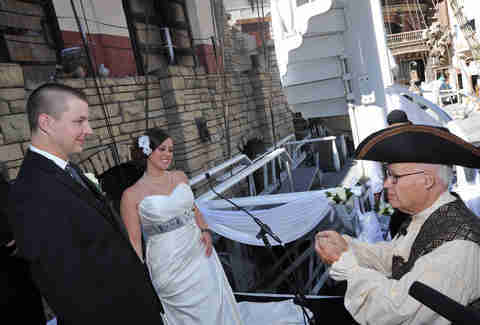 Maybe that’s why you should tie the knot while aboard the pirate ship in front of the Treasure Island Hotel & Casino. Hopefully your marriage won’t sink -- like this goofy boat used to do during regular performances of a musical pirate show that recently wrapped up to make room for a CVS. 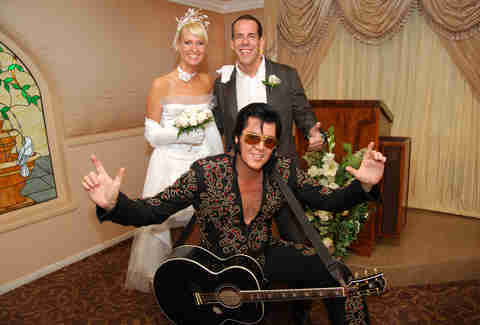 If Dad isn’t around, just get Elvis to walk the bride down the aisle at this "chapel" inspired by his Tennessee digs. The King (or the next best thing) will also sing anywhere from three to five songs while wearing your choice of a jumpsuit or black leather. Oh, and he's not the only rocker who might show up: this is also the same place that Jon Bon Jovi and Billy Ray Cyrus got hitched (although not to each other). Shotgun wedding anyone? 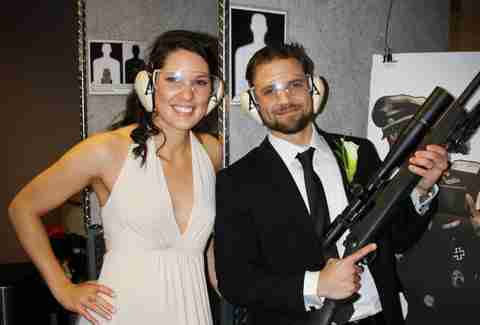 The Gun Store shooting range has its very own wedding chapel, and your ceremony's guaranteed to be a... waitforit!... blast 'cause the bride and groom get to fire off a few rounds after the ceremony. Upgrade to the Mr. & Mrs. Smith & Wesson package and get double the ammunition. Put on your best Gene Simmons makeup, play a few rounds of putt-putt golf and exchange vows inside the wildest rock n' roll wedding chapel in Vegas -- onstage with bright lights and fog machines -- just like a KISS concert in 1977. And who doesn’t want to kick off a lifetime of unholy matrimony with songs like “Love Gun” and “Lick It Up” playing in the background? If you want your wedding, reception, and bachelor party all rolled into one, you might as well just get married at a nightclub. Tryst is among the best in Las Vegas and comes with its own private lagoon and 90ft waterfall, which could be the perfect backdrop for saying “I do”. Either way, you know the bar's fully stocked. Get married in the former courthouse where gangsters were prosecuted back in the good ol’ days. Perfect for those who feel like marriage is like a jail sentence. Need to get away from the bright lights of Vegas? 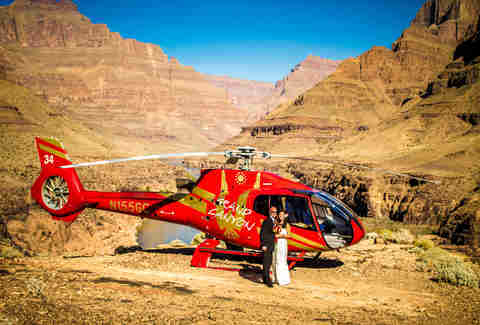 Papillon will fly you by helicopter from the Strip to the Grand Canyon for an outdoor ceremony in the biggest hole in the ground in the United States. You can also exchange vows on top of Tower Butte -- a 5,000ft rock formation that can’t be reached by car or foot. 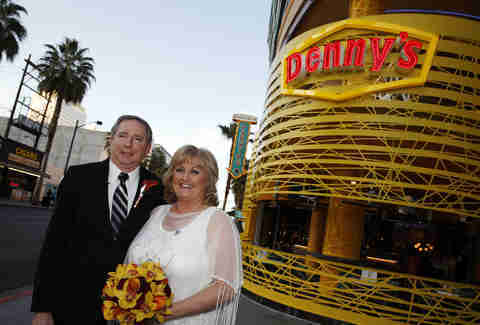 Denny’s new location on Fremont St comes with its own wedding chapel. Yep. After you tie the knot, grab a seat at your own special booth where you can toast the celebration with a fountain drink, nosh on wedding cake pops, and order a plate of Moons Over My Hammy -- or whatever kind of omelet hits the spot. 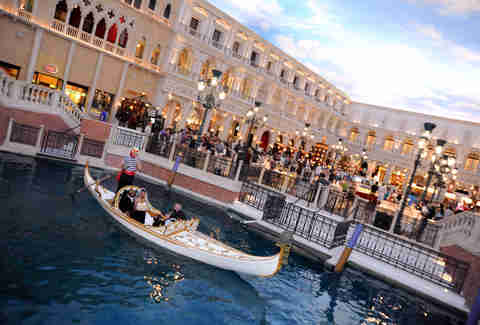 A wedding on the water may not be the first thing that comes to mind when you're in the middle of the desert, but the Venetian offers a ceremony on the gondolas that drift through the Grand Canal Shoppes and into the Palazzo next door. It will give your nuptials an Italian flair -- even if you can’t afford the airfare to Venice. 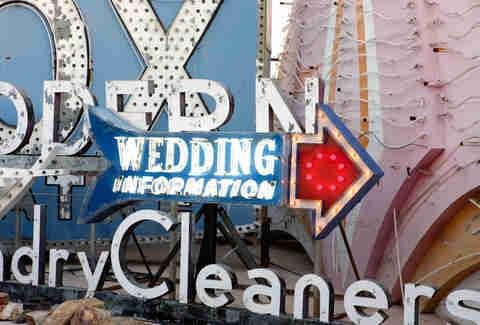 Home to the old neon signs and marquees that used to light up classic Las Vegas, the Neon Museum's already one of Vegas's top tourist spots, and it recently opened an outdoor wedding chapel that'll give your ceremony a vintage glow.